NYC, 03/04/2019, 7:00PM. 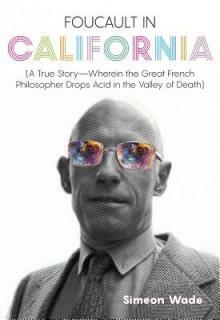 Foucault in California: A True Story Wherein the Great French Philosopher Drops Acid in the Valley of Death. In The Lives of Michel Foucault, David Macey quotes the iconic French philosopher as speaking "nostalgically...of 'an unforgettable evening on LSD, in carefully prepared doses, in the desert night, with delicious music, and nice people'." This came to pass in 1975, when Foucault spent Memorial Day weekend in Southern California at the invitation of Simeon Wade-ostensibly to guest-lecture at the Claremont Graduate School where Wade was an assistant professor, but in truth to explore what he called the Valley of Death. Led by Wade and Wade's partner Michael Stoneman, Foucault experimented with psychotropic drugs for the first time; by morning he was crying and proclaiming that he knew Truth. Foucault in California is Wade's firsthand account of that long weekend. Felicitous and often humorous prose vaults readers headlong into the erudite and subversive circles of the Claremont intelligentsia: parties in Wade's bungalow, intensive dialogues between Foucault and his disciples at a Taoist utopia in the Angeles Forest (whose denizens call Foucault "Country Joe"); and, of course, the fabled synesthetic acid trip in Death Valley, set to the strains of Bach and Stockhausen.